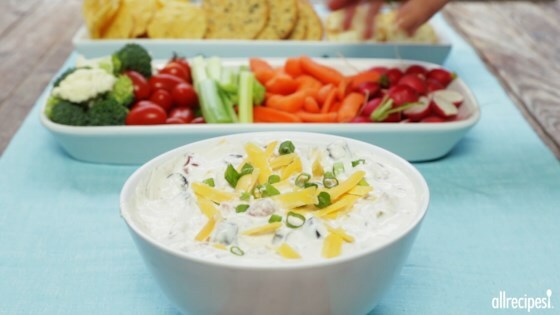 "This creamy chip dip is different from any I've ever had. Mix sour cream with tomatoes and green chilies, black olives and Cheddar cheese. Always a hit at parties. Great texture and taste! Serve with tortilla chips or crackers." Mix together sour cream, canned tomatoes, dry ranch dressing mix, black olives, and shredded cheese. Chill for 2 hours before serving. Very good - but like another reviewer said - use 8 oz sour cream,8 oz cream cheese and drain the tomatoes for a less watery more creamy dip! Great recipe. Everyone loved it. I do not like black olives at all and loved them in this dip. It is also really good as a spread on bread and as a topping for tacos. Everyone loved this dip!! My only thing is it goes runny after awhile (might drain some juice off). Great flavor. I did add a little green onion (had it on hand). Will make again for sure! !